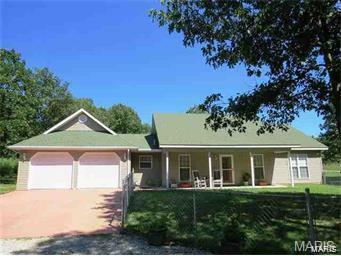 Looking to live outside city limits, then you will love this property! This home is nestled on a quiet, county road, just 1/10 mile off blacktop. Home is being completely remodeled; with new windows, flooring, light fixtures, brand new kitchen & appliances, and all new bathrooms!! Stepping inside this gorgeous home you'll fall in love with how open the area is. Kitchen will have custom cabinetry, butcher block counter tops and stainless steel appliances. There is a gas fireplace in the spacious family room & very roomie area for your dining room table. Home has the split bedroom floor plan. Master bedroom has a walk-in closet, with a full bathroom. Property has a wet weather creek, with plenty of room for kiddoes to run and play. If you love country then you will love this property!! More pictures to come!